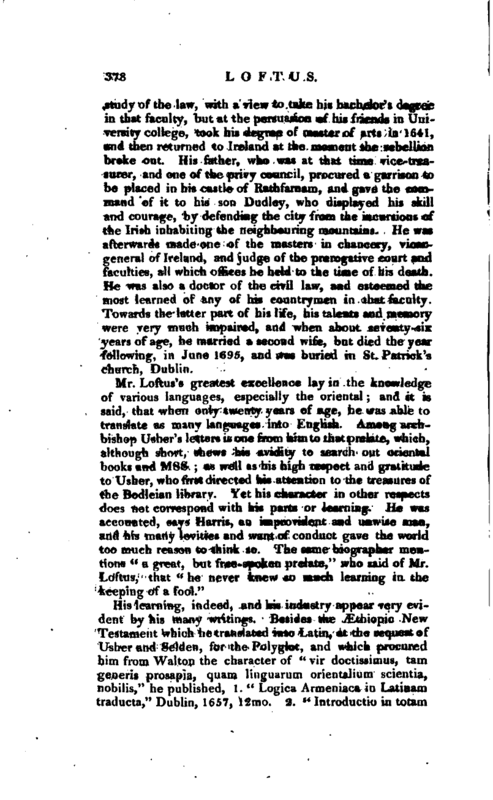 , a very learned oriental scholar, was the second son of sir Adam Loftus, and great grandson of Dr. Adam Loftus, who was archbishop of Armagh, then of Dublin, and one of the lords justices, and lord chancellor of Ireland. He was born in 1618, at Rathfarnam, near Dublin, a stately castle built by his ancestor the archbishop, and was educated in Trinity college, where he was admitted fellow- commoner in 1635. About the time he took his first degree in arts, the extraordinary proficiency he had made in languages attracted the notice of arciibishop Usher, who earnestly advised his father to send him to Oxford, where he might improve his oriental learning, a matter which that worthy prelate considered as highly important in the investigation of the history and principles of the Christian religion. 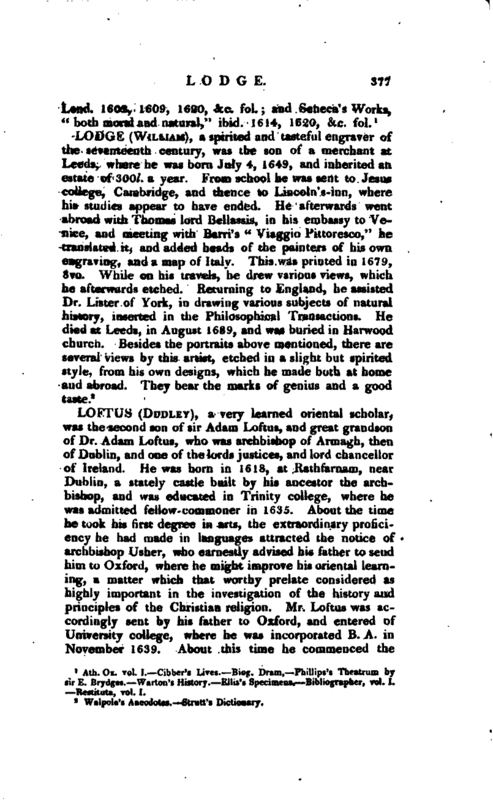 Mr. Loftus was accordingly sent by his father to Oxford, and entered of University college, where he was incorporated B. A. in November 1639, About this time he commenced the | study of the law, with a view to take his bachelor’s degree in that faculty, but at the persuasion of his friends in University college, took his degree of master of arts in 1641, and then returned to Ireland at the moment the rebellion broke out. His father, who was at that time vice-treasurer, and one of the privy council, procured a garrison to be placed in his castle of Rathfarnam, and gave the command of it to his son Dudley, who displayed his skill and courage, by defending the city from the incursions of the Irish inhabiting the neighbouring mountains. He was afterwards made one of the masters in chancery, vicargeneral of Ireland, and judge of the prerogative court and faculties, all which offices he held to the time of his death. 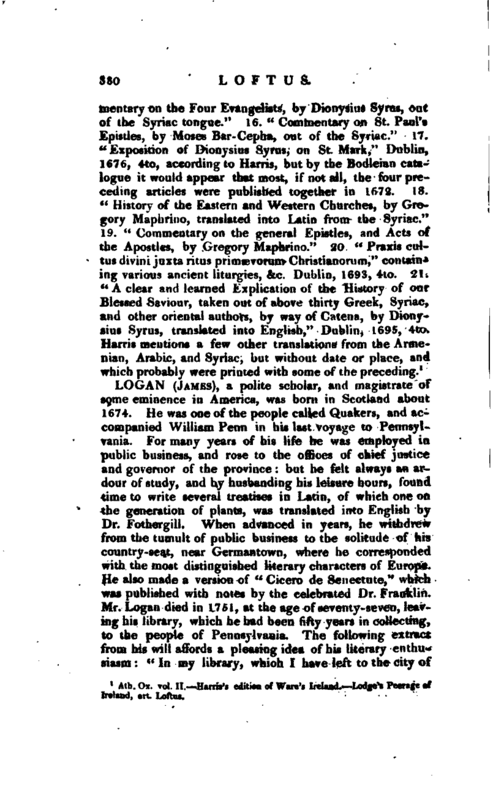 He was also a doctor of the civil law, and esteemed the most learned of any of his countrymen in that faculty. 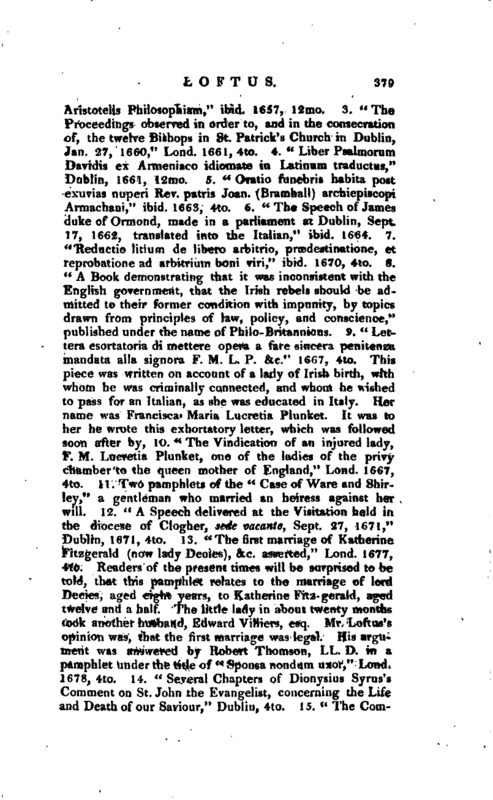 Towards the latter part of his life, his talents and memory were very much impaired, and when about seventy-six years of age, he married a second wife, but died the year following, in June 1695, and was buried in St. Patrick’s church, Dublin. 1 Ath. Ox. vol II. Harris’s edition of Ware’s Ireland. Lodge’s Peerage of Ireland, art. Loftus.